Horse mackerel or aji that is baked is high in protein and fats in addition to serving as a rich source of potassium and phosphorus. Due to the fact that it is dried, it can be stored in the freezer without any problems. Recipe sites show you how to bake it using many different kinds of marinades. 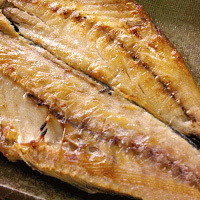 The calories in Horse Mackerel Stockfish per 78g(1slice medium) is 172 calories. Horse Mackerel Stockfish is calculated to be 220Cal per 100 grams making 80Cal equivalent to 36.36g with 19.19g of mostly protein、9.59g of fat、0.08g of carbohydrates in 78g while being rich in vitamins and minerals such as Vitamin B12 and Vitamin D.